Here is the list of Best Free Planetarium Software for Windows. These free software let you view and explore Space, right from your computer. Most of these software simulate sky exactly for current position and time on Earth. You can also manually set any location of Earth and set time in present, past, or future to view respective sky map. Some of these software simply take you to the object you want to view and have a 3 dimensional view. With these planetarium software, you can view Planets, Stars, Satellites, Galaxies, Deep space objects, Constellations, Nebulae, Asteroids, Comets, and much more. These software are like open atlas to the vast universe and carry information about millions of objects out there. While most of these tools let you view objects in 3D or as pictures, some only display the position of the objects. These software also carry detailed information about the objects, such as name, magnitude, hour angle, elliptical information, distance from the Sun, distance from the Earth, diameter, phase angle, etc. Another interesting feature that most of these software to view sky have is, animate movement of objects in sky in real time or fast forward. These software provide navigation tools to look around objects, and search tool to locate objects. All you have to do is simply enter the name of the object, and it will be displayed for viewing. There are various other interesting tools that these listed planetarium software have to offer. Go through the list to know more, and also know how to view sky using these planetarium software. Stellarium and Celectia are the planetary software that I like the most. These software provide excellent sky exploring tools and are very easy to use and get along with. The high quality imagery that these software provide are just amazing to view at. You an also checkout the list of best free Focus Stacking Software, Deblur Software To Fix Blurry Pictures, and Panorama Software For Windows. 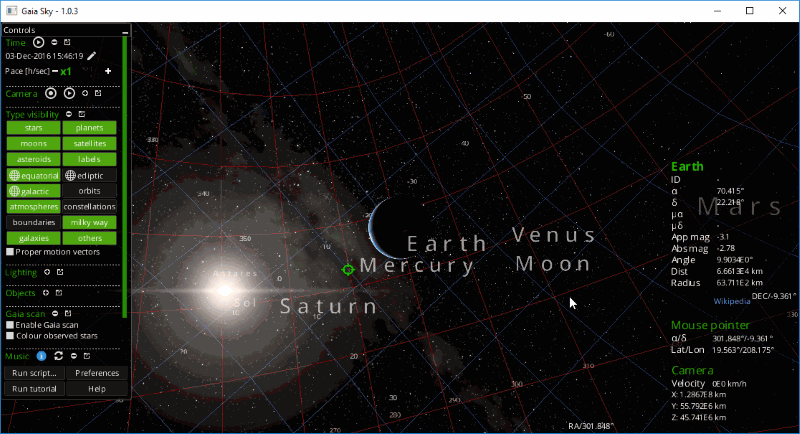 Stellarium is an open source planetarium software for Windows, Mac and Linux. It lets you have a look at the sky, just like you would from your eyes through a binocular, or through a telescope. It is a very vast software with extensive set of tools and options. Once you get to know about its features, you will be amazed by its capabilities. The tools available help you view stellar as well as interstellar objects, including satellites, planets, galaxies, constellations, etc. When you open the software, it displays a simple landscape along with sky. According to your time zone (which this software updates from internet), the landscape is displayed in day time view or night time view. The day time view only displays the Sun and the Moon if its in the visible sky. The sky lightens up during night time with the moon and all the visible satellites, planets, and stars. Zoom using the scroll key of your mouse and get a telescopic view of objects you’d like to view. Click on an object to view its details, such as: name, magnitude, hour angle, elliptical information, distance from Sun, distance from Earth, diameter, phase angle, etc. Using this planetary software for the first time can be confusing, as it has no options on the interface, just the landscape where you can look around. To put this software to a proper use, you will need to download the Stellarium User manual, which is available on the homepage of this software. The user manual is a 291 page long PDF file with Hot Keys, How To(s), and Catalogs. What you see when you open this software is a simple landscape, but the tools can be used to visualize a hell lot of things. This includes: Pause time, Fast forward time, Rewind time, Jump to a specific time in future or past, Jump to a location to get the respective sky view, View constellations, View Equatorial grid, View Deep sky objects, View sky with/without atmosphere, and much more. Information about various other tools, features, and configurable options including Plugins is available in the user manual. This planetary software runs very smoothly and does not lags even on computers without high end graphics card. 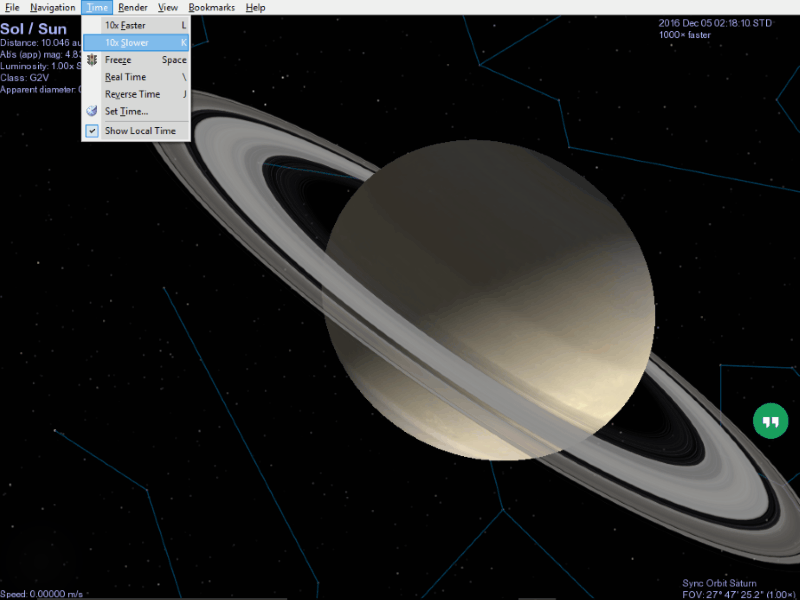 Celestia is a multi-platform Planetarium software available for free. It lets you explore the Solar System along with the vast expanses of the Universe, which includes planets, clusters, galaxies, and even deep space objects. All of this can be viewed in high resolution or low resolution, which can be manually set. Celestia does not restricts you to view objects from Earth’s point of view. You are free to go to a planet, a star, or even a galaxy to view it from a defined distance. All you need to do is enter the object’s name and enter a distance from where you want to take a look at it. You can Zoom to extremely high levels and view the celestial objects of our universe. While viewing an object, the info related to is displayed along with the distance from which you are viewing it in kilometers or astronomical units. All the objects being displayed on this planetarium software move in real time. You can view their exact movements with respect to the distance of view. If you want, you can Pause time, fast forward time, or slow time to view objects the way you like. You can also jump to a time in past or in future to view objects at the given point of time. A tour guide is available, which when given the name of a planet, satellite, star, galaxy, etc., takes you to it, and also displays a brief information about it. There are various other options available that can enhance your planetarium, or rather universe exploration experience. You can take a screenshot and even capture a video of your entire voyage through space. You will also find certain plugins on the website of this software which will enhance its capabilities and help you view more of the Universe. Celestia is an extraordinary planetarium software which runs in high resolution. If you do not have a high end graphic card installed on your PC, you can always lower down its resolution for it to work smoothly. 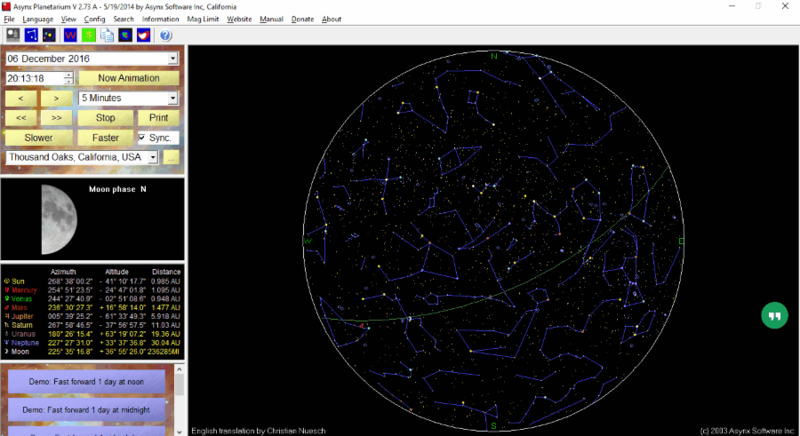 Hallo Northern Sky is a simple yet feature rich free planetarium software for Windows and Linux. It lets you look at the observable universe from your location. It has a huge database of millions of stars, galaxies, and deep space objects, which you can see by zooming onto them. When you load this software, a view of the visible sky is displayed with all the stars, planets, galaxies, and constellations. The constellations are connected and marked with lines. The Sun, nearest stars, and other 8 planets are also displayed along with their satellites. Scroll your mouse to zoom in and get a telescopic view of an object. The positions of the objects displayed are accurate within 1″, and are displayed with respect to current time and viewer location. If you want, you can jump to any given time in past and also up to 10 years in future to view position of stars, planets, etc. If you want to locate an object, simply go to the Find tool and look for Constellations, Stars, Asteroids, Comets, Deep Space objects, or Planets. You can also type the name of an object to find it. For the first time users, this software may seem to be tad bit confusing. Once you start exploring its options and get used to it, this planetary software will impress you by its simplicity. WinStars is another good planetarium software for Windows. Along with Planetarium view of the sky, it also offers Solar system view. It is very close to Stellarium in terms of the features and tools it has to offer, with an added advantage of interface. The Planetarium view lets you have a look at the sky from your location, which it detects automatically through internet. You can also jump to any place on earth and view how the sky looks from there. You can selectively highlight or turn name on/off for planets, stars, probes, comets, asteroids, etc. Also, you can set a desired time in past or future to view the respective sky. Zoom in to view objects in telescopic views. Some options let you turn on grid lines, ruler, and elliptical equator, so that you can pin point an object. If you wish to find an object, you can also make use of the Find tool available; simply type in the name. 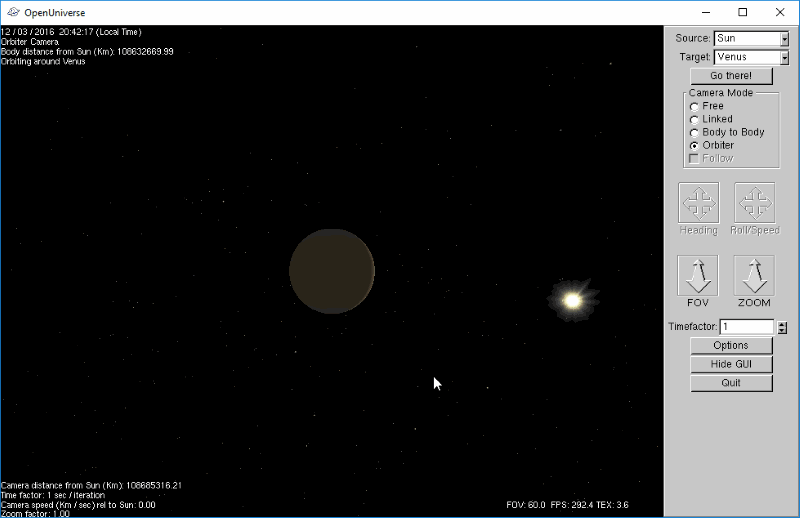 The Solar System view gives you a view of solar system from Earth’s orbit. You can view the planets, their path, the Sun, and all the stars, galaxies, etc. in the visible Universe. You can also turn on/off the visibility and names of stars, deep space objects, planets, probes, orbits, etc. There’s much more that can be done with this free planetarium software. Although it is similar to Stellarium, it is not as refined. 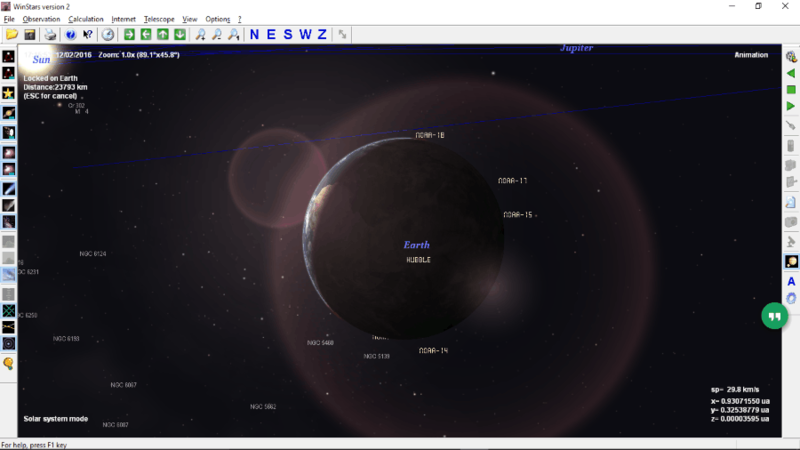 KStars is an open source planetarium software, which can run on Windows, Mac, and Linux. It lets you view the sky and explore it just like you would from Earth. It is mainly developed for educational purposes and has a database of millions of stars, thousands of deep space objects, all the planets, planets’ satellites, and the Sun. You can manually locate these objects or simply use the Find tool to locate them automatically, then zoom in to view. Its syncs with your location and current time, then displays the positions of objects in sky accordingly with precision. The sky moves in sync with current time; however, you can pause time or jump to a time in future or past to view respective sky. You can also fast forward time to play star and planetary movements. The horizontal coordinate grid along with direction marker lets you easily locate objects. To point towards an object and zoom it, simply drag the sky and bring the object to the center of the screen, then zoom. 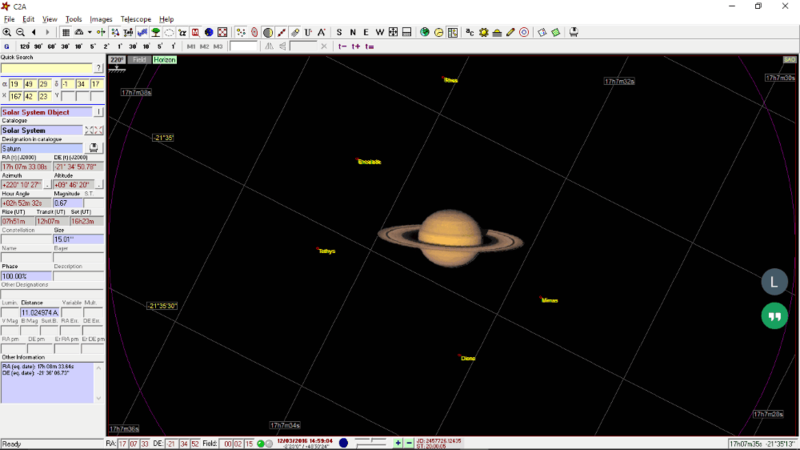 The set of tools available with this planetarium software are pretty rich. Some of the interesting tools are: Sky Calendar, Altitude vs Time, What’s Up Tonight, What’s Interesting, Solar System Viewer, Observation Planner, View Constellations, Constellation Art, etc. All in all, it is a very good planetary software which can be used for learning astronomy. 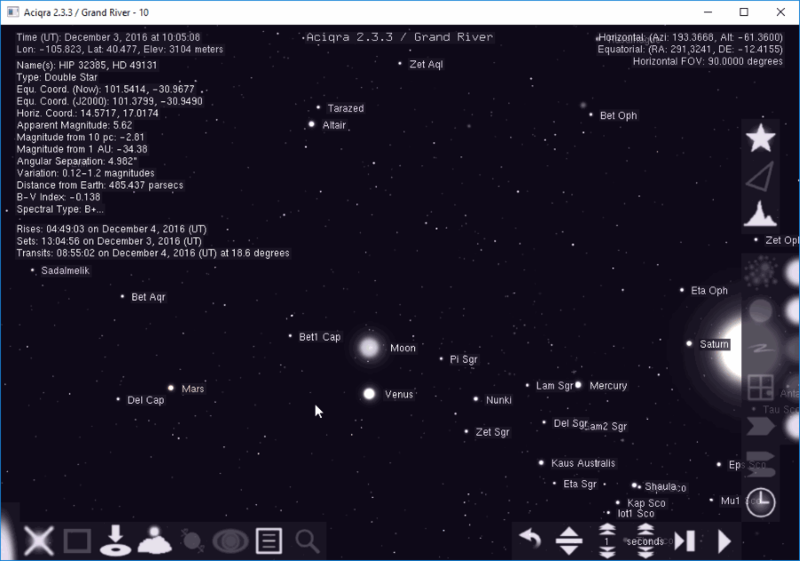 SkyChart, an open source planetarium software, also lets you prepare sky maps. It can be very well used to observe the sky from any location on Earth for current time, or a time in past or future. You can view millions of stars, galaxies, constellations, deep space objects, and planets of our Solar system. Objects can be viewed as they would appear by using various telescopes. Yes, you can select from a list of telescopes or even a manual mount telescope, where you can define various parameters. 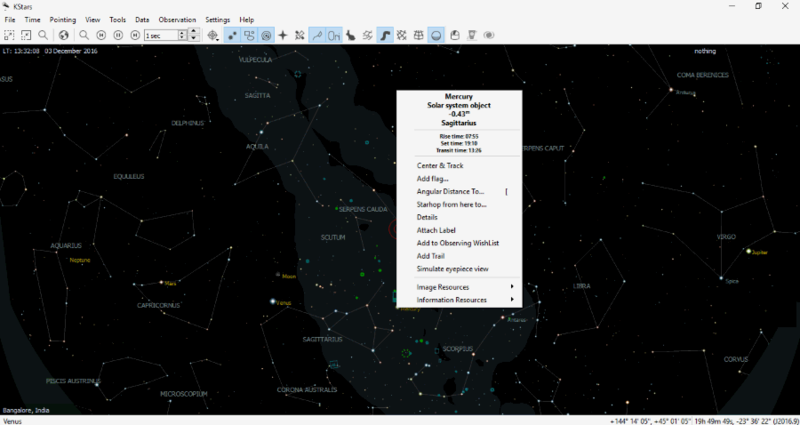 You can open multiple sky maps here in tabs, and even set a layout to view two different maps from different time, location, etc. at the same time. The tools to view sky map on this planetarium software are almost the same as a standard planetarium tool. Let me mention few tools: Time Jump, Show/Hide deep sky objects, Show pictures, Show comets/asteroids, Compass, Constellation lines and names, Distance measurement tool, Show objects below horizon, Run sky animation, and much more. 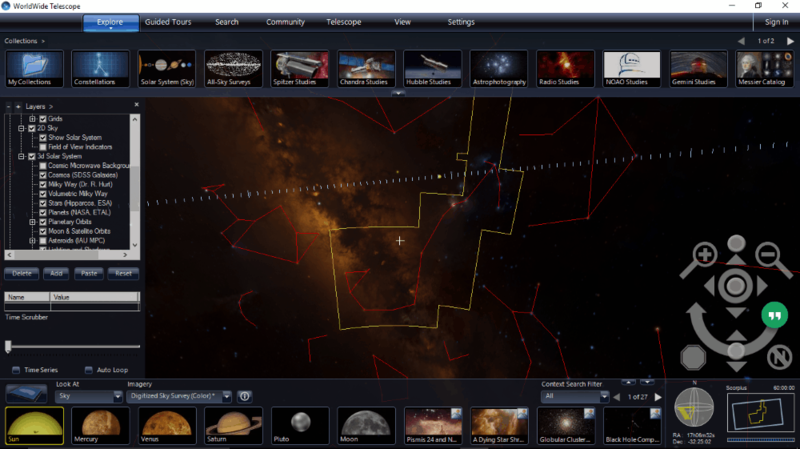 WorldWide Telescope is a visually appealing planetarium software with an intuitive interface. It has a high quality imagery and displays planets, stars, deep space objects, etc. in high definition. On top of that, the navigation system is just excellent. You can easily point out the object you want to view and zoom to view it. It lets you have a look on Earth, Sky from Earth, Planets, and Solar system. According to your selection, options are displayed. Select an option and this tool will auto navigate you there. The navigation tool lets you zoom, and rotate the object you are viewing, freely. You are also provided with guided tours to objects, get telescopic views, and set location on Earth to view sky from there at any defined time. The plus point of this software is its high definition imagery and brief intro about objects. If you have a slow processor, this software may lag a bit. Its perfect for computers with a dedicated graphics card. Space Engine is another excellent planetarium software which gives you high definition graphical experience while exploring space. It is way different from any mainstream planetarium software, as it simulates a travel to the object you want to view. To find an object, use the Search tool, which gives a list of explorable objects as you type a keyword. While viewing an object, you can hide/unhide Galaxies, Stars, Nebulae, Planets, Comet Trails, Atmosphere, Clouds, Water, Aurora, Orbits, etc. There are various exciting tools available which will make you fall in love with this software. One of these tools is Spacecraft Manager. This tool lets you build your own spacecraft, and travel to places in space with it. For the selected object, you can view its universe map. You can save a location to visit later. While viewing an object, you can change lighting angle to get a clear view. Use the mouse to zoom, move object, and use keyword shortcuts to perform various actions. Get the user manual to find out more about the software and its tools. Space Engine also requires dedicated graphics card to run smoothly. The minimum graphics card requirement is 1 GB. Visit homepage to view other minimum specifications required to run this planetarium software. Asynx Planetarium is a very simple planetarium software. It lets you take a view at the sky and displays all the visible stars and planets according to your location and current time. You can also change location and time manually to view the sky. You can locate a star or a planet, then click on it to view its details, such as: name, type, constellation, spectrum, mag, altitude, azimuth, etc. There are various viewing modes to take a look at the sky: Horizontal view, Geocentric view, and Heliocentric view. You can even run animation of sky movement in different speeds. Capture the sky as image, change star density, search for a constellation, and do much more. It is a simple planetarium software with very basic features, and can be used for elementary astrology studies. 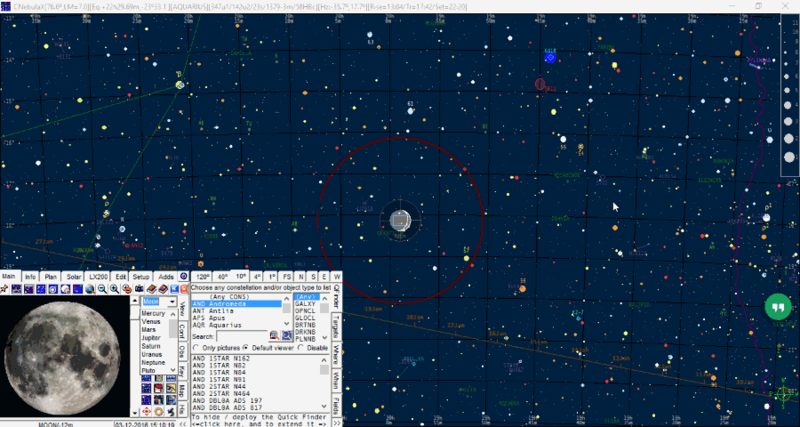 C2A is another free software to view stars, planets, and deep space objects. 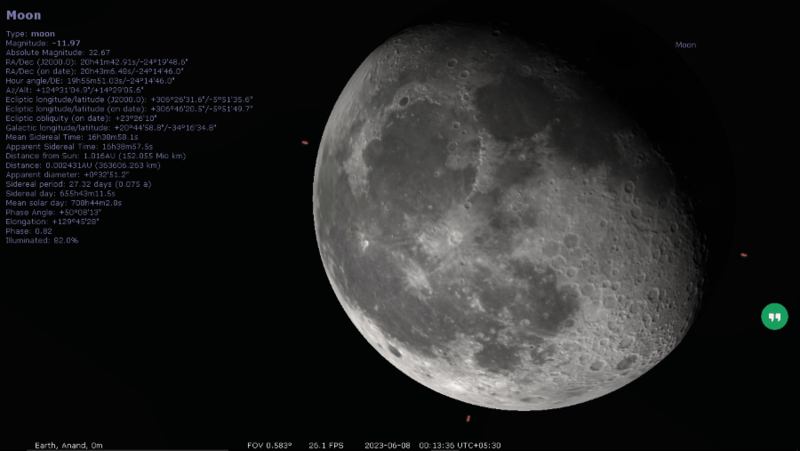 It has a simple and intuitive interface with tonnes of tools and options to let you study astronomy. Along with planets, galaxies, stars, constellations, it also includes asteroid and comet data. While exploring the sky, a double click on any object displays various information about it. Navigation is pretty easy, and the availability of Find tool makes it even easier to locate an object in the sky. Just like most of the planetarium software, you can view the sky map from any location on earth for any given time: past, present, or future. A telescope hand controller tool is available, which lets you manually zoom in and focus on to an object you want to view. The display options let you customize the sky the way you want to view it. You can hide/unhide names, asteroids, comets, deep space objects, planets, text, constellations, etc. separately. 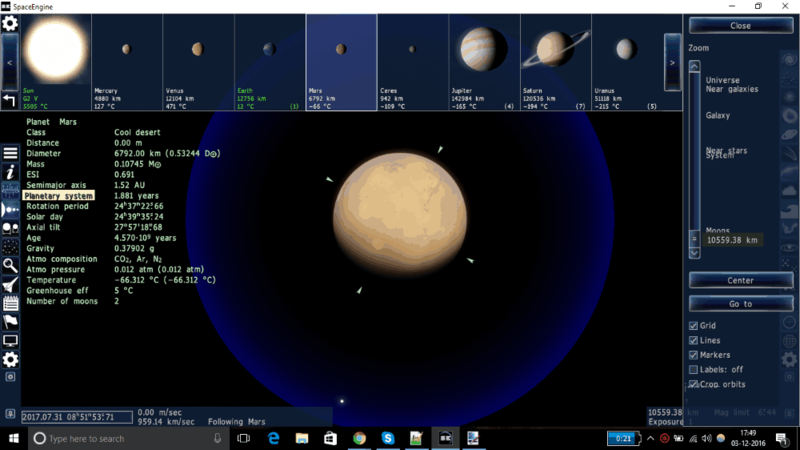 Aciqra is a very simple planetarium software to let you explore the space. The interface is very minimalist and has few but ample tools to let you view objects in the space, such as planets, stars, nebulae, and deep space objects. You can separately highlight and view stars, constellations, solar system, etc. The tools let you lay grids in sky, mark object path, label objects, hide/unhide atmospheric refraction, take screenshot, and much more. A Search tool is also available, which will help you look for objects in space. Click on an object to view a brief info about it. It also has a night mode. Its suited best for casual and primary educational purposes. OpenUniverse is a very interesting planetarium tool. 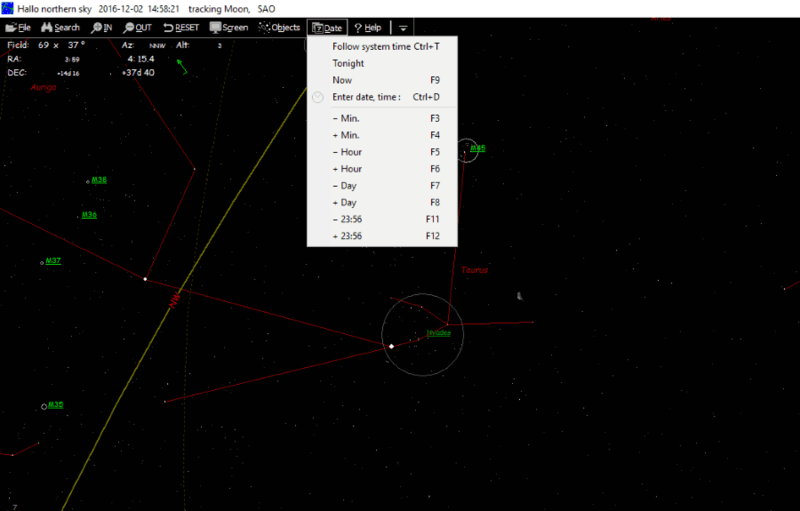 It lets you view objects in our Solar System by setting a Source and Target. This means, you can get a view from one object of our Solar System to another object. Say, you want to see how Earth looks like from Moon, so you set Moon as source and Earth as Target. There are various camera modes available, which let you view the target objects from different perspectives. The Time Factor option lets you fast forward/rewind the movement of planets and other objects in orbit. The options available let you decide whether you would like to include Atmosphere, Lighting, Textures, Stars, Milky Way, Messier objects, Info, Star labels, etc. in the field of view. It has various hotkeys to ease the task of navigation. Go visit the User Manual Page to know about them. CNebulaX is a very good planetarium software and also lets you create sky maps. It displays the visible sky map in various angular grids, such as: 120 degree grid, 40 degree grid, 10 degree grid, and 1 degree grid. Click on an object to view related information. If you want to jump to an object simply by finding it, using the Search tool. You can also enter coordinates to find objects. Track an object to create its sky map. Skymaps can be saved as BMP images. You can view star positions according to different locations and time in past or future. Monthly, daily, or yearly plots can be drafted for selected objects here. One of the tools lets you check visibility for selected object to be viewed from naked eyes. There are various other tools that can help you out for carrying calculations and get data for astronomy studies. Gaia Sky is a planetarium software related to Gaia Space Observatory. It displays all the imagery recorded by Gaia and also lets you closely inspect Gaia along with planets, stars, galaxies, constellations, deep space objects, and much more. Simply select an object, or type the object you want to visit. Gaia takes you there and lets you observe it in a 3 dimensional view. You can view and track the path of objects as well. One of the best features of this planetarium software is support for Visual reality headsets, Gamepad controllers to navigate through space, and Spacecraft mode (get into a spacecraft to explore the space). It has excellent navigational capabilities, and can be used primarily to explore space visually. It can be controlled from its interface; however, there are certain shortcut keys which you can use for easy navigation and functioning. You can view these shortcuts when this planetarium tool starts. 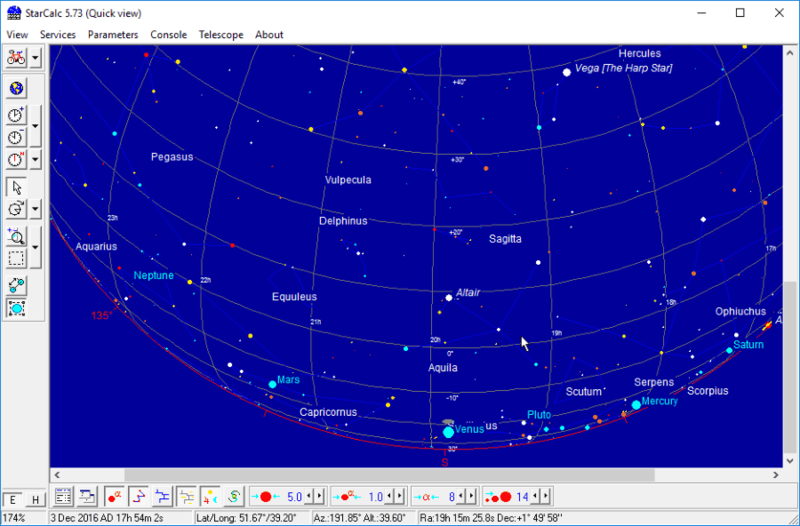 StarCalc is a very lite, professional planetarium software and also a sky mapping software. It has a huge database of stars, planets, galaxies, etc. You can use it to map and locate objects in the sky. The positions of the objects can be viewed precisely for a given position and time on Earth. It also lets you automate the sky by letting them move in real time or with a faster speed. 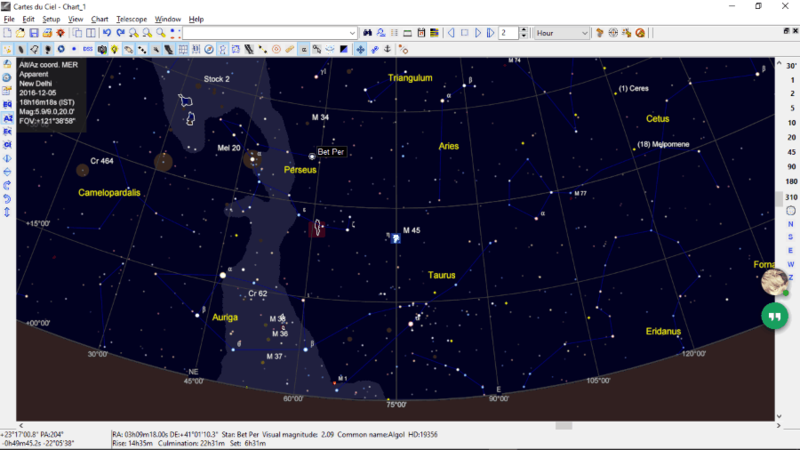 Save a sky map or print it directly from this free planetarium software to view sky.